The organ pipes date from the late 17th century, made into a new organ in about 1840. 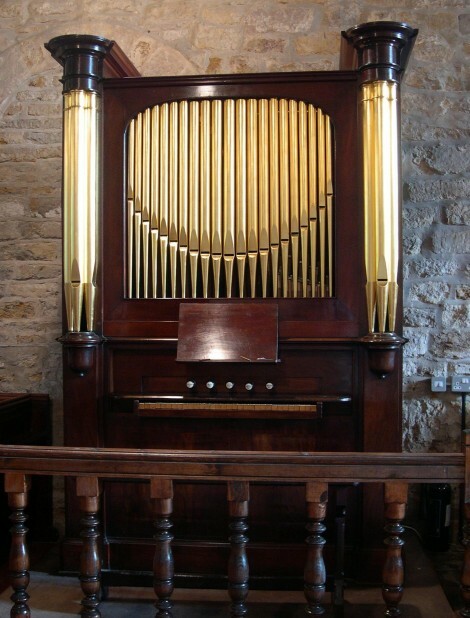 The organ was found by Francis Jackson and introduced to the church at Crambe in 1962. It came from Keswick College, who bought it from Shalton St Mary church, Long Stratton, Norfolk in 1949. There is a single keyboard with a compass of GG – e³, short compass 54 notes, the lowest key (GG) appearing to be BB. The wind pressure is 51mm. The pitch is about a = 432Hz at 14°C. The temperament is one described sometime around 1700 as being used by Renatus Harris. It is around 1/5 comma meantone but has the D# sharp raised so that the key of b major is usable. The one deviation from the described tuning method has been to raise the G# as well, so that the key of Ab is also (just about) usable. Work was completed on 12th May 2006, in time for a concert of sixteenth century English church music sung by the workshop choir with Derek Adlam playing the organ. In the following year Francis Jackson gave a concert on the organ. For the church the restoration project was guided by Fiona le Masurier.